Life on the road can be exhilarating, but you still need modern supplies – like a clean, hygienic toilet. There are many models on the market, but some outperform others. If you’re on the go and need to go, we researched a variety of new and bestselling products to find the best portable toilets. The result is the top portable toilet review list below. Before we get into our portable toilet reviews, here is what you need to know when shopping. 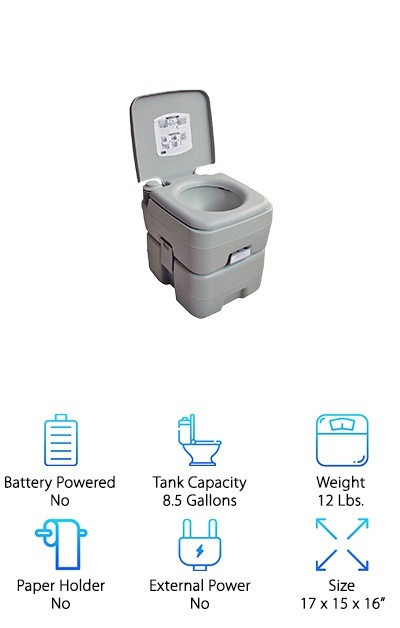 Battery Powered: Our choices on the top ten best toilet review list below include portable toilets that are battery powered and others which require an external power source. If you need the best portable toilet for camping, for example, battery-powered could be best. 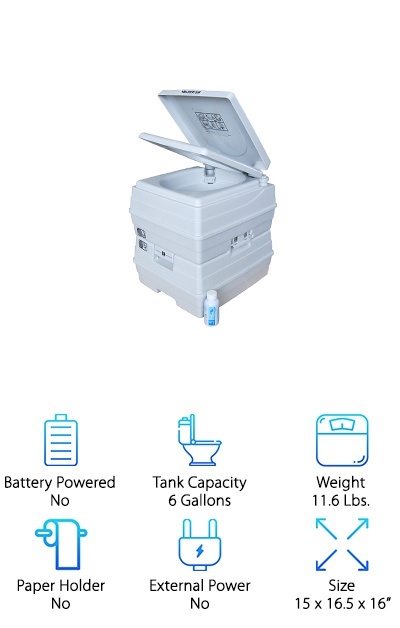 Tank Capacity: The tank capacity category will give you a good idea of the overall capacity of the portable toilet you are checking out. Some have larger tanks and can accommodate a family, while others may be better for a solo traveler. Weight: If you are bringing a portable toilet with you as you move about the country, the weight factor is an important one. We mark the weight in pounds so that you know how easily it can be transported. Toilet Paper Holder: Many of our favorite selections on this list of reviews include a toilet paper holder, eliminating one more thing you have to worry about as you shop. There are different styles of holders, and we’ll describe them in our reviews. External Power: Are you traveling with access to an external power source like an electrical outlet, or a generator? We’ve picked some great portable toilets that plug in to get going. Check this category to see what your favorite product needs to operate. Size: Our final category is size, where we've noted the height, weight, and width of every toilet on our top ten list. Whether these are portable toilet trailers for sale or something smaller, the dimensions are included for you. Now that you know how to find the best portable toilet for you, your family or your friends, it’s time to get to the reviews. Here’s the deal: If you don’t have a lot of time, you can take a look at the top pick and the budget pick. Both are fantastic products and among the very best we found. Right below, you’ll find all of the runner-ups in our portable toilet reviews. If you’re looking for the best toilet, it’s here! 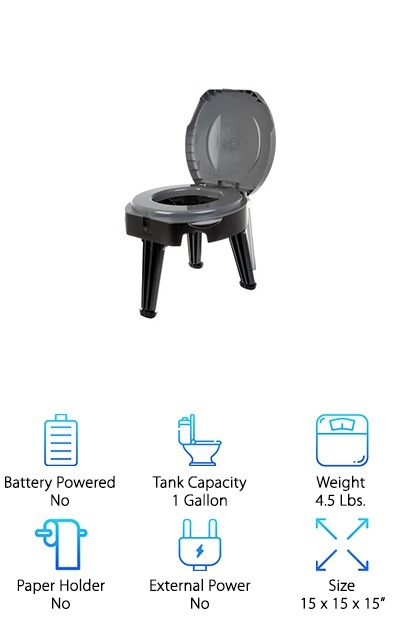 Our top pick puts the "portable" in a portable toilet. You can take it with you nearly everywhere. The Thetford Porta Potti Curve Portable Toilet can be carried around with an ergonomic carrying handle. It's not tough to carry – it only weighs ten pounds. Once it's in place, use the optional kit to secure it to the floor. Then, you can fill the 4-gallon water tank. There are another 5.5 gallons of space for wastewater. An integrated toilet paper holder means you won't be reaching far. And when you're done, operate the battery-powered flush. A sealed valve keeps odors inside the toilet. And a rotating spout will help you empty the wastewater tank without getting dirty in the process. This toilet is extremely easy to clean, and it won’t get in the way of your lifestyle. Use it while camping, living off the grid, or on your boat or RV. You will love this sleek and modern amenity too! Simple is best when it comes to communing with Mother Nature and enjoying the great outdoors. If you are embarking on a long hike or a camping trip, dealing with trips to the bathroom can be nerve-racking. Simplify your outing and your basic human needs with the Reliance Products Self-Contained Toilet. There are two important things to know about this portable toilet. The first is how easy it is to use. The toilet is made up of five parts: an outer lid, an inner lid with a toilet paper holder, a seat, an outer bucket and an inner bucket. That’s it. The inner bucket can be removed for cleaning or waste removal. The second thing to know is how affordable it is. After purchasing, waste bags are just an additional two dollars each with our budget pick. You can also use your own bags, too, and even kitty litter as some users have suggested. The entire toilet weighs just five pounds. The easier a portable toilet is to use, the more popular it will be. Hikers, campers, and other outdoor enthusiasts are searching for something that doesn't cost a lot and lasts for as long as possible. Public bathrooms are hard to come by when you’re headed through redwoods or moving from lake to lake. These are all reasons why our reviewers really like the Camco Standard Portable Travel Toilet. The setup is intuitive and easy to use. On top, you have the toilet lid, bowl, and seat. A sealing slide valve keeps any smells from seeping out. 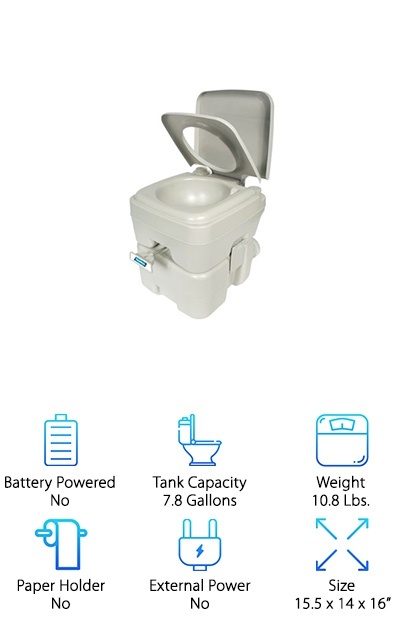 The toilet feeds into a holding tank with a 5.3-gallon capacity. There is also a 2.5-gallon flush tank. While some toilets need to either be plugged in or run off batteries, this one just takes a little muscle. Use the bellows-style pump to flush water through after you’re done. The holding tank is detachable and easy to clean out. Try it out today! To keep things sanitary in your RV or on your boat, a portable toilet with a generous load capacity can be a lifesaver. This toilet can be carried on board with one hand and placed unobtrusively into a corner. The Five Oceans Camping Portable Toilet is a gray polyethylene toilet, weighing about 12 pounds. Built-in handles make it very easy to lift. It does not need to be connected to anything, and the bellows-style button next to the seat does the flushing for you. No batteries are required. A huge 3.2-gallon freshwater tank contains enough water for 50 flushes before things need to be cleaned out. All the waste goes into a 5.3-gallon capacity tank. That tank is easily removable! It all adds up to a device that is convenient, quiet, and helpful for single travelers or groups in motorhomes or caravans. It gets better: This toilet can handle a 440-pound load, too. Kids and adults alike will appreciate it. The American Outland Portable Toilet is a smart and economical way to deal with a situation like providing bathrooms on a job site or working in a remote area with no restroom access. The design is smart and convenient. The upper portion of the toilet contains the seat, the lid, the pump and the fresh water tank. All waste flows into the lower tank for later disposal. That tank holds 5.3 gallons of wastewater. A family of 4 can use this for a weekend in the woods, and only need to empty it once. The pump is bellows-style, so moving it up and down flushes water through and moves waste away. It also helps minimize any smells. American Outland’s toilet is big enough at 18 by 15 by 15 inches to accommodate even larger adults. It does not require batteries or external power sources. There are no cords or valves to connect. It is a breeze to operate! It doesn’t get more straightforward than this. The Reliance Products Luggable Loo Portable is just that – a basic, simplified toilet for when Mother Nature calls far away from civilization. If you have a disaster preparedness kit, or you’re thinking about preparing for the apocalypse, this product has to be in your arsenal. It will last forever until it’s needed. What are we talking about? 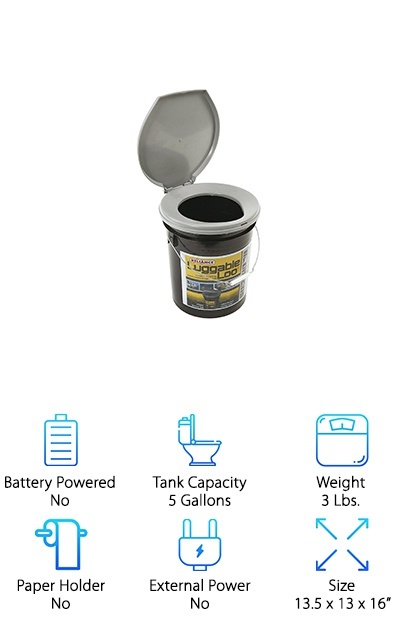 The Luggable Loo is a plastic bucket with a comfortable seat on top. It weighs a measly 3 pounds, with a 5-gallon capacity. If you’re headed out for deer season or going canoeing across the wilderness, strap this onto your bags or throw it into the back of your truck. You’ll be glad you had it available when everyone else is busy digging holes in the ground. The seat also has a snap-on cover that will minimize any stinky odors. When the right waste bags are used with this bucket, it’s a cinch to clean up. Does the idea of hovering in a Porta-John make you shudder? Are you trying to find something a little more sanitary for your next hunting or camping trip? We have a much better choice for you: The Cleanwaste Go Anywhere Portable Toilet. Built like a stool with a toilet on top, you just unfold and lock the three legs. No assembly is required. On top, you have a seat and a bowl with the same dimensions as a standard toilet. It can support up to 500 pounds! And the stool-style design means it will sit steadily on uneven ground, too. Waste bags will keep the odor from going anywhere, and there is also a net in place to keep the waste bag from slipping. Finally, when you’re done, this portable toilet folds up like a briefcase! Tuck one into your RV, one into your boat, and keep one with your camping gear. It will come in handy for years! Clean and tidy is the name of the game with the Reliance Fold Go Portable Toilet. All you have to do is unfold the three locking legs, placing them on either flat or rocky ground. Either way, it will stand firm. On top are a toilet seat and lid, with a bowl for placing a sanitary waste bag. With your purchase of the Reliance Portable Toilet, you receive a Double Doodie bag for removing waste without excess odor issues. Just seal it, and throw it away, and your toilet-to-go is ready for its next round. 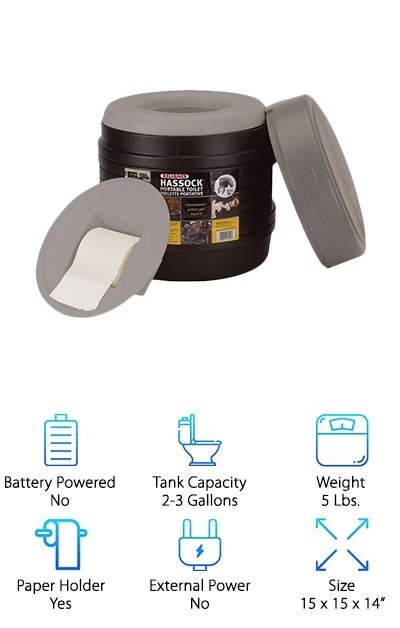 The Reliance toilet collapses and at just 4.5 pounds, it's incredibly easy to throw one in your truck, another into your motorhome, and perhaps one in your emergency readiness kit. It's very affordable and comes with a 5-year manufacturer's warranty to protect against any defects. You don't need to purchase batteries or find a place to plug it in. This purchase is a no-brainer! A family camping in Yosemite, a hunter tracking deer in Michigan, a surfer catching waves in Rosarito – all of them have something in common. They need a clean, safe location to use the bathroom without exposing themselves to germs or disease. All of them can bring along the Jaxpety 20L Flush Porta Potti and never worry about restroom access again! What are we talking about? 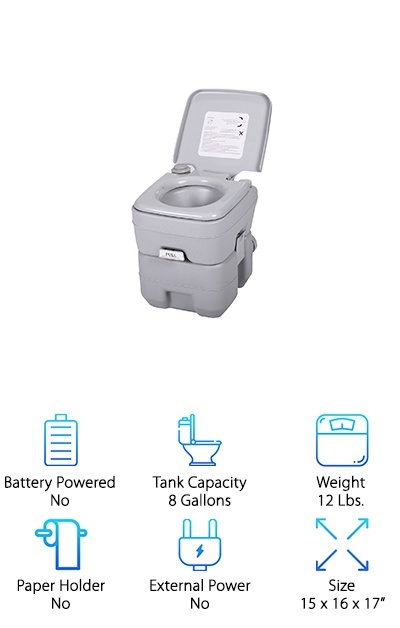 This 15 by 16 by 17-inch portable toilet is an innovative piece of equipment. It functions without the need for batteries or electricity. On top is a toilet seat, bowl, and cover, with an attached tank for holding 3 gallons of clean, fresh water. Once someone does their business, they press the bellows-style button on the back to move clean water through and into the waste tank below. The waste tank holds 5 gallons of wastewater, so it will last the average couple 4 or 5 days. Just pull the lever to detach for emptying! If you want more than just a “bucket with a seat on top,” take a look at this wonderful item. 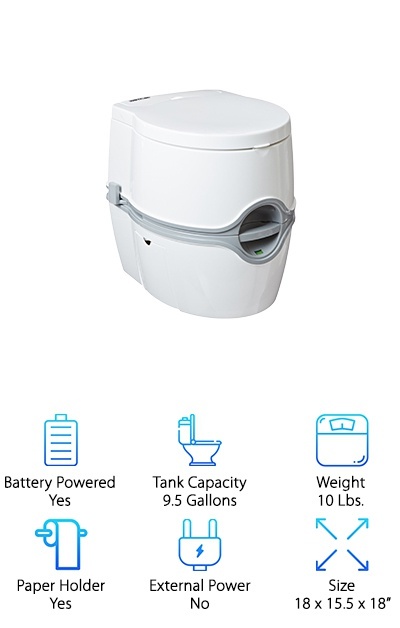 The Sanitation Equipment Visa Potty is ready for even the biggest and heaviest users. Even better: It sits as tall as a regular toilet, so you aren't squatting down and injuring your knees as you "go." 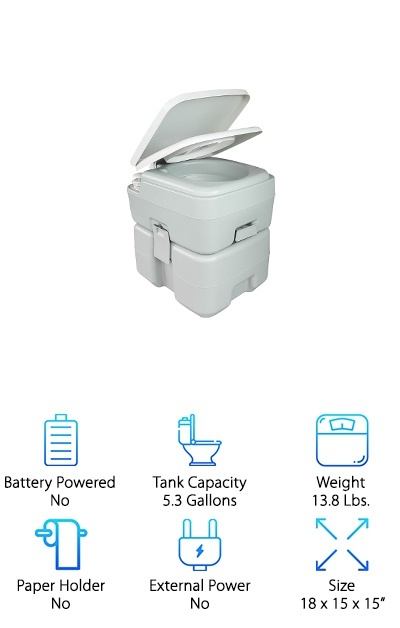 This portable toilet is divided into an upper and lower section. Up on top, you have the lid, seat, and bowl with a piston pump attached. Once you're done with your business, you use the piston pump to fill the bowl with water. There is a two-directional rinse, so you get great coverage. Flush the wastewater into the lower receptacle, which holds over 6 gallons of liquid. That is one of the largest holding tanks on our list! No external power sources or batteries are needed to operate this toilet, and cleaning it is also easy. Pour from the spout, or attach a hose!